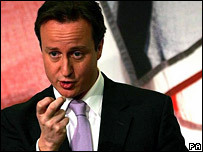 Councils should hold referendums if they want to bring in high council tax increases, says David Cameron. If people voted against a rise, they would get a rebate the following year, the Conservative leader explained. He said the current system of central government "capping" bills in England and Wales was "an old-fashioned idea straight out of the bureaucratic age". But Communities Secretary Hazel Blears said the proposal was "just another empty David Cameron gimmick". Under the plans, outlined in a speech in east London, there would be a "trigger threshold", above which councils would have to hold a referendum. In England this would be set by Parliament, with the Welsh National Assembly deciding the level for Wales. Bills sent out to households would ask whether they supported any "excessive" increase, with a referendum form attached. Mr Cameron told BBC Radio 4's Today programme that capping, introduced by Margaret Thatcher's Conservative government in the 1980s, had been necessary at the time to deal with "some very left wing councils" trying to "fleece" their residents. But he said things had changed and he wanted councils now to have more control and freedom to respond to local circumstances, while offering residents a guarantee that council tax levels would not spiral. "Yes it would mean in many cases that councils would not be able to increase tax because people wouldn't want that to happen but I think it's right to give people the ultimate say," he said. "I want to replace bureaucratic accountability with democratic accountability." Councils favouring big rises in tax "must explain" to local taxpayers why they want to raise taxes by so much and what they would do, through a shadow budget, in the event of their plans being rejected, he said. "Council tax referendum ballots would be sent out with the annual council tax bill - and if people voted against the rise, a rebate would be credited to the next year's bill." Local government expert Tony Travers, of the London School of Economics, told the BBC he thought it would not be "very different" from capping as many councils would simply spend up to the upper limit. He said the fact it did not propose going back to allowing local councils to set their own taxes showed how "politically dangerous" the issue still was. The government has previously considered forcing local authorities to hold referendums if they propose council tax rises double the rate of inflation. And some local authorities - Croydon, Milton Keynes and Bristol - have trialled council tax referendums in the past. In Croydon and Bristol residents voted for the lowest possible rise in council tax. A spokesman for the Local Government Association said voters were already able to vote against rises in council tax - via the ballot box in local government elections. Councils should be freed from all Westminster interference when setting the tax, he added. For the government, Ms Blears said: "Any local council can hold a local community vote on the level of council tax increase, and some of them already do.... You don't need some new law." She accused Tory councils of driving up levels of council tax and cutting local services. And Vincent Cable, acting leader of the Liberal Democrats - who want the council tax scrapped and replaced with a local income tax - said: "Forcing councils to hold referendums on tax increases will have exactly the same impact as the current system of capping. "No one will take the Tories seriously until they realise that council tax - which they introduced - is fundamentally unfair because it is unrelated to people's ability to pay." Peter Facey, director of Unlock Democracy, said: "Replacing a national cap with a nationally set limit is hardly a step forward. "The real priorities for reviving local government are devolving powers, financial autonomy and fair votes to ensure that councils are representative of the people they serve."